AN iJNiKCjLUjv ilON TO CHEMICAL CRYSTALLOGRAPHY 11Y P. GRQTH K 01 M1MBUALOOV AW CltYHTALLfM. nAlHY IM TUB, UNIVERSITY OF MHNIOH A UTI1 ORISED TRANSLA TTON HUGH MARSHALL, D. Sc., F. R. S. LKCTUBEU ON CHEMISTRY AND ON MINKBAIOCV ANI CUVHTALL IN TIIK UNIVKRS1TY Ol-UDIN1IUKUH LONDON GURNEY JACKSON 1906 PREFACE IN this short treatise on general chemical crystallography the attempt has heeii made to present the hitherto recognised relations between the properties of crystallised sub stances and their chemical constitution on the basis of a definite view regarding the structure of crystals. 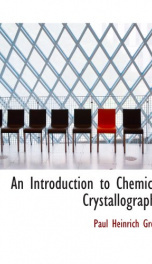 In doing so, a knowledge of the crystallographical laws is assumed, to an extent corresponding to the elementary treatment of them as contained in my text book, Physikalischc KrystaUngraphie, now appearing in its fourth edition for information regarding the terms here employed, and also for a fuller introduction to the theory of crystal structure, together with the geometrical ideas requisite thereto, the reader is referred to the above work. In order to secure a maximum of conciseness and brevity in the treatment, it lias been necessary to forego entering more fully into the different views which at various times have been propounded regarding the matter in question. Anyone who wishes information regarding the history of the development of chemical crystallography, will find a short historical treat ment of the subject in Section TIL of the Inti f oducti tn fa Chemical Crystallography, by A. Fock Leipzig, 1888, and especially in the extended English version of the same work, by W. J. Pope Oxford, 1895 there is a detailed and complete statement in the excellent work by A. Arzruni, Physikalischc Chemic der Krystallc Brunswick, 1893, which also constitutes Part I. of Graham-Ottos AusfiihrUches Lclirbnch der Chemie. Subsequent investigations in this field are contained in the various volumes of the Zeits. hrift a 2 vi PREFACE ffir Krvstallographic, partly in the form of original contribu tions, partly as abstracts. The investigation of the dependence of the properties of crystallised substances on their chemical nature naturally belongs to the domain of physical chemistry, whose vota ries, however, during the period of the rapid develop ment of this branch of science, have busied themselves chiefly with the study of amorphous substances and especially of solutions. Only quite recently have they begun to turn their attention to crystallised substances, and numerous investigations have been published, particu larly concerning so-called u mixed crystals, but mostly confined to theoretical deductions from the phase rule, or to the determination and discussion of fusion curves. However valuable such investigations may be, they can never take the place of the exact examination of the crystal lisation products themselves as is evident from the fact that substances have been designated as isomorphous merely on the evidence of the fusion curves of their mix tures, even although nothing was known regarding their crystallographical relationships. This arises from the circumstance that the laws observed with amorphous substances cannot be directly applied to crystallised sub stances, which are essentially so different from them and especially from the fact that many things of totally distinct nature, whose differentiation still requires further investiga tion, are thrown together under the name of solid solu tions... --This text refers to an alternate Paperback edition.